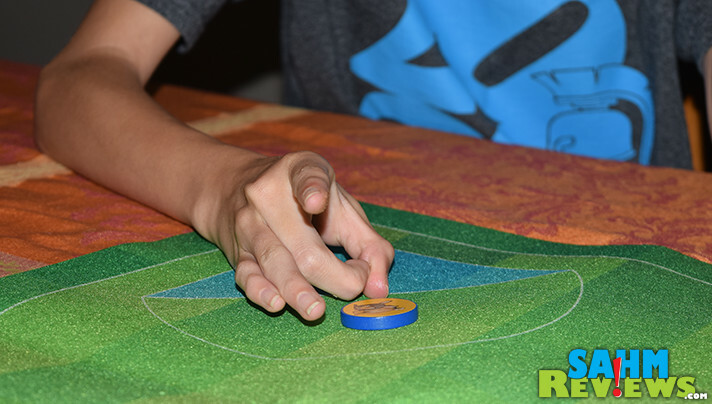 We play a lot of complex games with our kids on game nights. We’ve always felt that learning can be fun and have found many board games that can teach things like history, mathematics, science and finance. It helps that we have girls who don’t mind learning new concepts outside of school – they’re just happy to be playing together as a family. But I have to admit, sometimes we want to mix things up and not have to think too much about the game in front of us. 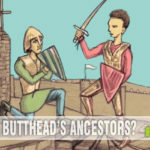 I personally am not one for silly games that involve pantomiming or getting slapped in the face with pie, but put an old-fashioned dexterity game in front of me and I’ll gladly volunteer to be first player! Other than shooting marbles on the dirt ground, the very first dexterity game I recall ever playing was a homemade one. One that I think nearly every boy my age played at one time. Paper Football. We would carefully fold a piece of paper into a triangle, tuck in the edges and get ready to let it fly! We had three chances to flick it over the edge of the table, not letting it fall off. It had to balance on the end with some portion hanging over in order to count as a touchdown. A successful shot, or a failure followed by a field goal attempt, was the real fun of the game. We would stand the football on end, holding it like a real NFL placeholder, and flick it through the goal posts made by your opponent with their hands. A wild miss might end up on the next lunch table, or even worse, the table full of girls! 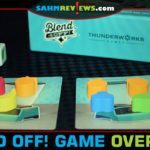 There have been a number of board games that have tried to recapture that grade school experience, but for me, none had lived up to the task. That is until we discovered Zoo Ball by Osprey Games. Not only did it instantly remind us of Paper Football (albeit the European version of “Football”), it supports up to four players! Zoo Ball isn’t for everyone. It’s not a thinker, there are no dice to roll and you won’t learn anything new from playing. What you will do is have old-fashioned fun, the same way you did when you were six years old. And you don’t have to worry about losing your best shooter marble. 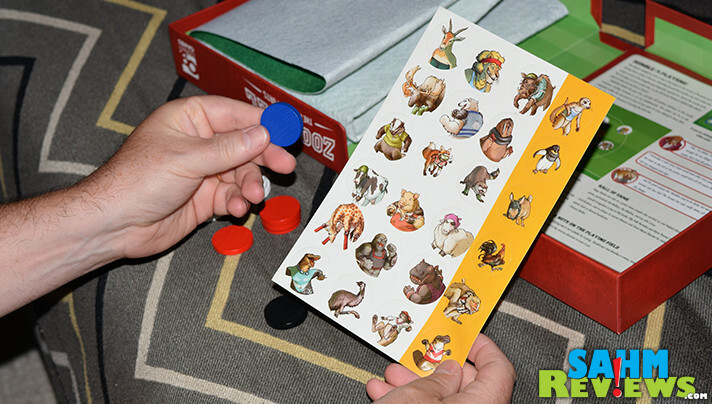 Inside the box you’ll find a felt playing board and sixteen wooden discs along with a sheet of stickers. 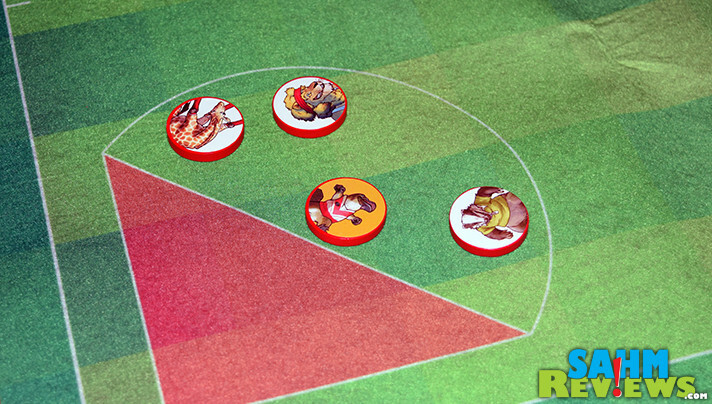 There are purposely more stickers than discs, allowing you to customize your own animal-themed team as you see fit. You can recruit a walrus, otter, lion, crocodile and much more. Even though there are 24 different animals, all have the same abilities. Maybe that’s fodder for a future expansion?! Players take the four discs of their team’s color and place them on the felt field. Each person has their own designated starting area and can arrange their team however they wish. 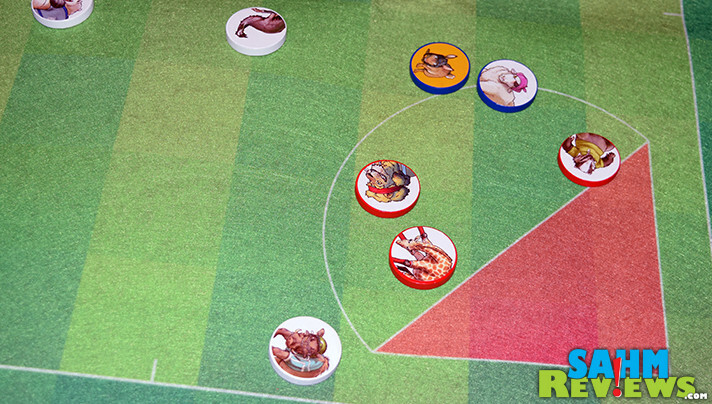 Your team is made up of three blockers (white background) and one scorer (orange background). The goal of the game (pun intended) is to score in the opposing goal area with your scorer piece while preventing your opponent from doing the same. On your turn you have a choice of flicking either your scorer or ALL three blockers. You’ll need to balance your offense with defense to make sure you’re not scored on. If a disc goes off the play field on the opposite side, it is returned to the mirrored spot on your side of the field. Once a goal is scored by getting your scorer disc completely inside the scoring area without touching any of the lines, a point is tallied and the entire board is reset. 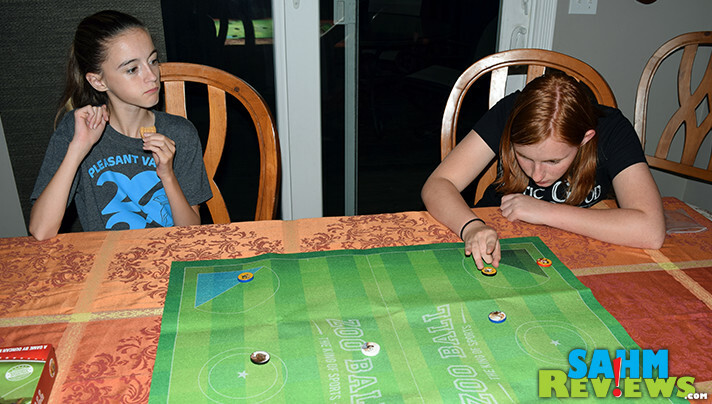 In a four-player game, even though you’re only trying to score into the area on the opposite side of the board, if any player scores, the entire board is reset. So not only do you have to pay attention to what your direct opponent is doing, you might need to help out on defense on one of the other goals to prevent someone else from scoring! While the game’s nickname is “The King of Sports”, it might as well be called “Every Animal for Themselves”! You can play one round of Zoo Ball with winner-take-all, or multiple rounds until one person gets a pre-determined number of points. Depending on the accuracy of the players, expect a round of Zoo Ball to last from 5-10 minutes. 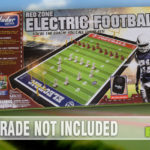 And although advertised for ages 8+, this is certainly a title that can be played by almost any age – even those as young as four or five! 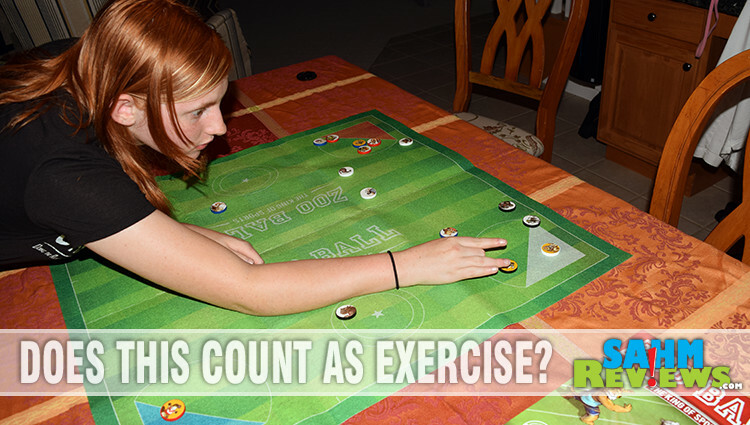 At under $25 Zoo Ball is a complimentary game to others that might have your brain working overtime. We can see adult-only (bar room) rules being applied, as well as house rules of shooting with eyes shut, opposite hand or even behind-the-back. Some of these we wish had been officially included in this first edition – maybe they’ll make the cut for a future issue or expansion! 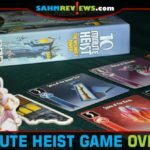 Here’s your chance to start working on your own ruleset! 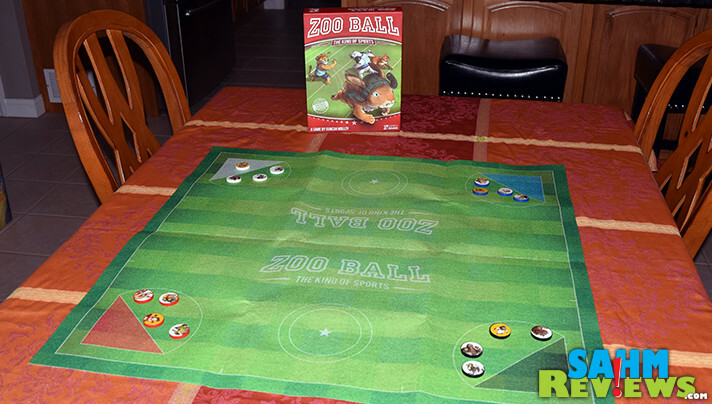 Enter to win your own copy of Zoo Ball from Osprey Games below, and don’t forget to come back daily for more entry opportunities. Just don’t pick the team with the penguin on it – that one is mine. You are right! Some time I prefer playing one kind of board game no need using brainstorm too much! This is good idea for our team this weekend! I would want a DRAGON to be in my team! I’d want sugar glider, so nimble! I would want the pig on my team. I would pick the rabbit. I want the Polar Bear on my team. I want to be the Fox because my maiden name is Fox. I mean…it just has to be!